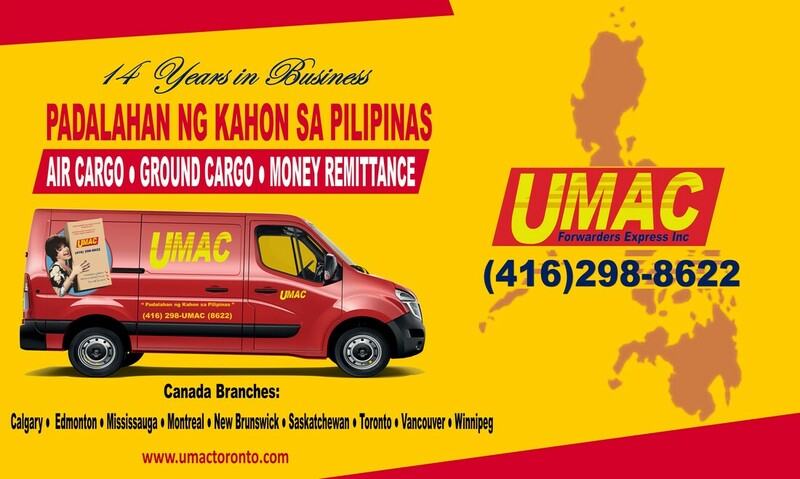 Umac Forwarders Express is an established professional Courier Company with its headquarters based in Scarborough, Ontario. Delivering Cargo boxes' to the Philippines since 2004, and now offering a wider range of services from money remittances, documents, parcels throughout Canada to local, national and international destinations on the same day and also next day deliveries. We fully understand how important it is to have a package delivered on time and in condition it was sent. We will not let you down; from collection to delivery we are the courier you can trust. Thou it is a little bit expensive than the other door to door cargo it is worth it and the shipping is very fast. It depends when you have them picked up the dr to dr is received within 5 weeks considering their standard estimate time in Metro is 6-8 weeks. I am fully satisfied and will recommend this cargo shipping and very courteous and friendly personnels. They are on time as per agreement. Thank you UMAC Toronto for good service. So happy for the service, driver and delivery man. My box receive by my family safe and good condition. Highly recommend!